George Washington – It's Hamiltime! One great example of the legendary collaboration between Washington and Hamilton during Washington’s presidency is in the written correspondence they shared in the summer of 1792. 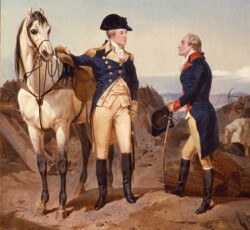 Washington described concerns that were raised to him about the administration’s policy’s, most of which had been built and enacted by Hamilton himself. In response, Hamilton (unsurprisingly) drafted a lengthy, 10,000+ word response that addressed each of the objections Washington presented. I’ve included excerpts of some of the objections and Hamilton’s responses that I found most interesting below along with some commentary and analysis, but I encourage you to read the full letters, available from Founders Online. You can find Washington’s July 29, 1792 letter here, and Hamilton’s August 18, 1792 response here. 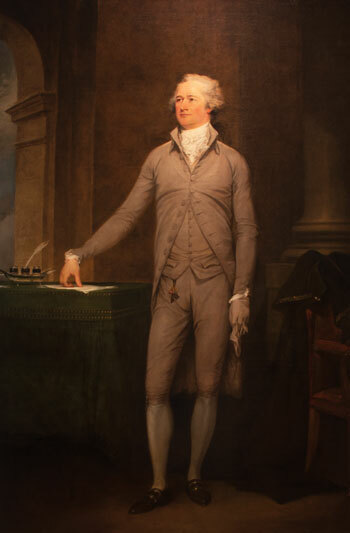 Washington divided the concerns into twenty-one categories, and asked Hamilton to respond to those criticisms “as soon as you can make it convenient to yourself.” Most of the criticisms focused on financial policy. Hamilton responded about three weeks later with a lengthy point-by-point defense of the policies he had put into place. After an extensive justification of his financial policy, Hamilton responded to the political points raised by critics. One of the objections Washington included was that Hamilton’s ultimate goal was to change the present republican form of Government. Critics today have sometimes leveled the same criticism of Hamilton. “To this there is no other answer than a flat denial—except this that the project from its absurdity refutes itself. The idea of introducing a monarchy or aristocracy into this Country, by employing the influence and force of a Government continually changing hands, towards it, is one of those visionary things, that none but madmen could meditate and that no wise men will believe. If it could be done at all, which is utterly incredible, it would require a long series of time, certainly beyond the life of any individual to effect it. Who then would enter into such plot? For what purpose of interest or ambition? To hope that the people may be cajoled into giving their sanctions to such institutions is still more chimerical. A people so enlightened and so diversified as the people of this Country can surely never be brought to it, but from convulsions and disorders, in consequence of the acts of popular demagogues. At age 21, a young and fiery Alexander Hamilton directed some serious vitriol towards Samuel Chase, a Maryland Congressman. As a Congressman, Chase had known of Congress’ secret plan for securing flour to supply the French fleet. He then passed on this information to profit-minded associates, who hatched a plan to corner the supply of flour and raise its price. In a series of three Publius letters in October and November 1778, Hamilton blasted Chase for seeking to profit from the Revolution, and using his position as a Member of Congress to damage the country and the Revolutionary movement. But when a man, appointed to be the guardian of the State, and the depositary of the happiness and morals of the people—forgetful of the solemn relation, in which he stands—descends to the dishonest artifices of a mercantile projector, and sacrifices his conscience and his trust to pecuniary motives; there is no strain of abhorrence, of which the human mind is capable, nor punishment, the vengeance of the people can inflict, which may not be applied to him, with justice. If it should have happened that a Member of C———ss has been this degenerate character, and has been known to turn the knowledge of secrets, to which his office gave him access, to the purposes of private profit, by employing emissaries to engross an article of immediate necessity to the public service; he ought to feel the utmost rigor of public resentment, and be detested as a traitor of the worst and most dangerous kind. The honor of being the hero of a public panegeric, is what you could hardly have aspired to, either from your talents, or from your good qualities. The partiality of your friends has never given you credit for more than mediocrity in the former; and experience has proved, that you are indebted for all your consequence, to the reverse of the latter. Had you not struck out a new line of prostitution for yourself, you might still have remained unnoticed, and contemptible—your name scarcely known beyond the little circle of your electors and clients, and recorded only in the journals of C–––––ss. But you have now forced yourself into view, in a light too singular and conspicuous to be over-looked, and have acquired an indisputed title to be immortalised in infamy. The love of money and the love of power are the predominating ingredients of your mind—cunning the characteristic of your understanding. This, has hitherto carried you successfully through life, and has alone raised you to the exterior consideration, you enjoy. The natural consequence of success, is temerity. It has now proceeded one step too far, and precipitated you into measures, from the consequences of which, you will not easily extricate yourself; your avarice will be fatal to your ambition. I have too good an opinion of the sense and spirit, to say nothing of the virtue of your countrymen, to believe they will permit you any longer to abuse their confidence, or trample upon their honour. Hamilton urged Chase to resign from office in light of the scandal, and to stop the facade of patriotism. It is a mark of compassion, to which you are not intitled, to advise you by a timely and voluntary retreat, to avoid the ignominy of a formal dismission. Your career has held out as long as you could have hoped. It is time you should cease to personate the fictitious character you have assumed, and appear what you really are—lay aside the mask of patriotism, and assert your station among the honorable tribe of speculators and projectors. Cultivate a closer alliance with your D—s—y and your W—t, the accomplices and instruments of your guilt, and console yourself for the advantage you have lost, by indulging your genius, without restraint, in all the forms and varieties of fashionable peculation. Hamilton’s accusations effectively ended Chase’s career in the Continental Congress, and led him to near bankruptcy. Chase went home to Maryland, but returned to the national stage in the 1780s as a strong critic of the new Constitution. Chase would eventually switch his political beliefs and became aligned with the Federalist Party. 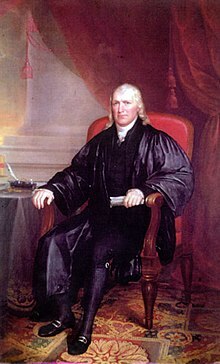 Interestingly, after his fall from the Continental Congress in disgrace, Chase was appointed by President Washington to be a Supreme Court justice in 1796. Chase later came into President Jefferson’s cross-hairs after openly criticizing the Democratic-Republicans for the repeal of the Judiciary Act of 1801. Chase was served with eight articles of impeachment, and Vice President Aaron Burr presided over his impeachment trial. Chase was ultimately not impeached by a large margin, and served on the Supreme Court until his death. Chase’s victory in avoiding impeachment helped maintain judicial independence from the executive and legislative branches. To read more about the trial, I recommend a 1967 article from the Maryland Law Review: “The Trials of Mr. Justice Samuel Chase.” It’s a fascinating read, and is available for free online via Digital Commons. In an August 18, 1792 letter to President Washington, Hamilton commented on the differences between the South and North and described the talk of separation from a small group of “respectable men.” Hamilton noted that “happily,” despite this talk of separation, the “prevailing sentiment” of the people during this time period was in favor of maintaining the Union. It is certainly much to be regretted that party discriminations are so far Geographical as they have been; and that ideas of a severance of the Union are creeping in both North and South. In the South it is supposed that more government than is expedient is desired by the North. In the North, it is believed, that the prejudices of the South are incompatible with the necessary degree of Government and with the attainment of the essential ends of National Union. In both quarters there are respectable men who talk of separation, as a thing dictated by the different geniusses and different prejudices of the parts. But happily their number is not considerable—& the prevailing sentiment of the people is in favour of their true interest, union. And it is to be hoped that the Efforts of wise men will be able to prevent a scism, which would be injurious in different degrees to different portions of the Union; but would seriously wound the prosperity of all. Hamilton’s words of warning, nearly 70 years before the Civil War began, underscore the deep-seated tensions between North and South. Broadway World reported today that “auditions are currently underway to fill several key roles” in Lin-Manuel Miranda’s forthcoming Hamilton play at the Public Theater. The show is scheduled to run from January 20-February 22, 2015. Tickets for the show went on sale to Public Theater members last week and tickets to the general public will go on sale July 29. (I am going to the January 21 and January 23 performances!). Interestingly, the casting call lists an extension closing date of May 10, 2015, suggesting that perhaps the theater is anticipating a longer run for the show. GENERAL NOTE: Looking for people of all ages and all ethnicities for these roles. This storyline spans 25 years+, so age is not literal – like Aaliyah said, it’s nothin’ but a number. AARON BURR: tenor/baritone, sings and raps in equal measure. Our narrator. A cool, steely reserve. An orphan raised in wealth, plays his cards and opinions close to the vest. Slow to anger, but when he gets there, look out. Javert meets Mos Def. GEORGE WASHINGTON: tenor/baritone, sings and raps in equal measure. Authoritative, regal, aloof, aware of his place in history at all times. John Legend meets Mufasa. HERCULES MULLIGAN/JAMES MADISON (dual role): Tenor/baritone, MUST be able to sing and rap well. MULLIGAN is the life of the party, dripping with swagger, streetwise and hilarious. Joins the revolution to get out of being a tailor’s apprentice, and befriends Laurens, Hamilton and Lafayette. Busta Rhymes meets Donald O’Connor. MADISON is incisively intelligent, quiet, professorial. A former Hamilton ally, he becomes Jefferson’s detail man concerning all matters—he gets things done. RZA meets Zach from Chorus Line. KING GEORGE: tenor, British accent. The King of England. Entitled, pouty nihilist. Sees the American Colonies as a deluded former lover, who will come crawling back. Rufus Wainwright meets King Herod in JCS. PEGGY SCHUYLER/MARIA REYNOLDS (dual role. ): Mezzo-soprano. PEGGY SCHUYLER: sweet, shy, youngest of the three Schuyler Sisters. The Michelle Williams of Destiny’s Child. MARIA REYNOLDS: sultry, young, calculating. Affects the role of a damsel in distress to seduce Hamilton. Jasmine Sullivan meets Carla from Nine. All other roles have been CAST. Hi all, sorry for the lack of posting recently. I’m in New York City and working on some Hamilton research and will share details here in the next few weeks. I wanted to bring your attention to some great Hamilton events going on this weekend (July 26-28, 2013) in Upstate New York. The events are sponsored by the AHA Society to honor the 225th anniversary of the ratification of the US Constitution in New York (July 26, 1788). The ratification of the Constitution in New York was a dramatic, tumultuous event. When the debates began, the consensus of the delegates was to vote strongly against the Constitution. However, by the time the final votes were counted, Hamilton’s persuasive skills had secured a 30-27 vote in favor of ratification, thus making New York the 11th state to join the Union. Saturday at 11:30 in Garrison- A narrated walk tracing the steps of Benedict Arnold’s escape route/Hamilton’s chase route down to the Hudson River. Sunday at 3 pm in Newburgh- a lecture series about George Washington and his aide-de-camp Alexander Hamilton in the Hudson Valley. The speakers for the afternoon include Hamilton scholar Michael Newton, AHA Society President Rand Scholet, and Johanna Porr, Director of the Historical Society of Newburgh. The lectures will take place at the Newburgh Heritage Center, also known as the Old Courthouse. For a full listing of the events, see here. See here for a record of the debates surrounding the New York Ratification Convention. As Secretary of Treasury, Hamilton worked diligently to create a network of federally funded lighthouses throughout the country. Hamilton was the first head of the Lighthouse Services. Cape Henry in Virginia was the first new lighthouse built from federal government funds through Hamilton’s program. In March 1791, the Government signed a contract with John McComb to build and equip a lighthouse for $17,500. Once the structure was completed, Hamilton and Washington personally handled many of the minute details of selecting light keepers and funding repairs. Ron Chernow characterizes the process of building lighthouses as “an administrative routine that stifled the two men with maddening minutiae.” The first lighthouse keeper selected by Washington, William Lewis, was a former soldier in Washington’s army and was hired in October 1792. The lighthouse below, at Cape Hatteras in North Carolina, was built on a spot that Hamilton passed as a 17-year old on his first journey from the West Indies to New York. Reportedly, the ship carrying Hamilton, the Thunderbolt, caught fire and nearly sank a few miles away from the cape. In 1794, Hamilton, who dubbed Diamond Shoals, the “Graveyard of the Atlantic,” recommended establishing a lighthouse on the Hatteras Sand Banks to Congress. On July 10, 1797, Congress authorized $44,000 for constructing a lighthouse at Cape Hatteras. During the early years of the American Republic, Hamilton’s work with the Coast Guard and the Lighthouse Services both facilitated commerce and strengthened the power of the federal government.